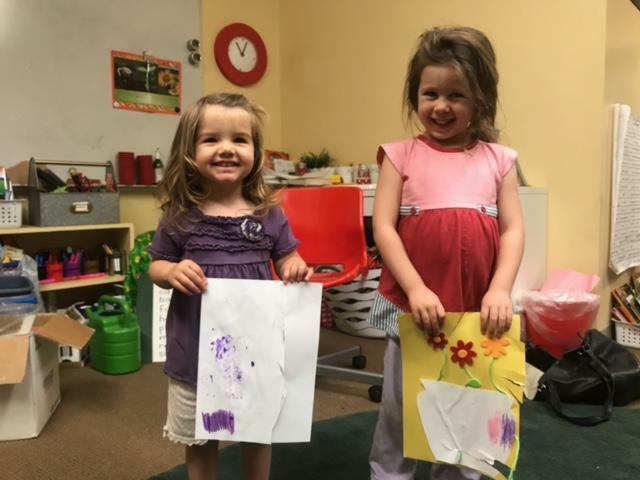 This week, in the spirit of the festival of Shavuot/Shvues (in which we tell the story of Ruth and Naomi), we explored our community’s different kind of “b’sheret” families – families from different cultures and backgrounds that have chosen to come together out of love. In many ways, all families are “b’sheret” families! We read “Daddy Christmas and Hanukkah Mama” by Selina Also, about a child who is a “mix of two traditions.” We explored the different heritages in our families, including Lithuanian, Moroccan, French, and English. We sang “Under one Sky” about all the people in our families. Finally, we made a lovely art project of pots of diverse flowers, representing the different members of our families that come together in love to create beautiful bouquets. Alef had a magnificent day today learning all about Shavuot, or Shvues. But before we learned about this unique harvest-oriented holiday, we noted that it was also Mothers’ Day today, and how Mothers’ Day is a good day to not only celebrate mothers, but all sorts of families that may or may not include a mom. To that end, we read a book called “The Family Book” by Todd Parr, which explores all the different types of families that exist. Then, we talked about Savues, which is a celebration of spring harvest-time. We talked about what it means to “harvest,” and then we practiced this concept by planting our own little watermelon seeds in cups, which we took home! To make sure we really drove the concept home, we all ate some watermelon that the teacher had brought, to get a little teaser of how delicious the watermelons we planted will be once they’re grown and we harvest them! Alef had a blast today on what was our SECOND TO LAST DAY OF SHOLEM THIS YEAR!! We began the day by meeting in the Beys classroom and practicing the rather magnificent song and dance routine we’ll be performing with Beys for graduation next Sholem-this is one you don’t want to miss out on! This considerably elaborate routine took the first half of the day to learn, so after doing so we relieved ourselves with a nice bagel break. After that, we gathered for a game of Brownie Bingo! This is a game in which we reviewed all the many different things we’ve learned over the year: there was a plate of brownies, each with a little picture of something we’ve learned about this year (a menorah, loaf of challah, etc.) stuck on a toothpick. The student who could identify and describe the image got to eat the brownie it was on! We also learned that the teacher, Grant, will not be teaching Alef next year on account of him moving, but that he will be visiting a lot, because he’s going to miss all his little friends very dearly! We’re all very excited for our graduation, and we can’t wait to see you there. It was a small class as it was Mother’s Day. We made Mother’s Day cards while listening to Klezmer Music. Then we moved to the carpet and did a name game and talked about Mother’s day. We then switched back to the Klezmer theme and read a book about Klezmer that Dani had picked out. Sunny read to the other students and it went well. They were engaged and liked the story. We ended up re-visiting the story at the end of the day. Beys class got into a fun groove with the Alef class as we starting practicing our graduation song. We added movements to the song “Under One Sky” and learned new lyrics. We talked about what the song was trying to say. We then said our “goodbyes” to the Alef class and began talking about our new Jewish “hero”, Leonard Nimoy. I showed the class a video of some of his work and then we broke for bagel break. After break, we read a book about Leonard Nimoy, outlining his childhood up to his Star Trek breakthrough role. It was so interesting to learn that the Vulcon greeting he thought up was the “shin” sign in the Hebrew alphabet. We all practiced our shin hands as we said the iconic greeting “Live long and prosper.” It was also interesting to note that Lenny’s parents (who were Russian immigrants) had their passports stamped “Alien” when they first entered the country. Leonard Nimoy always felt he could relate to his “alien” role since he felt it firsthand as a child in Boston. The Alef class then re-joined our class to practice one more time, with Ruthy assisting us. After we bid adieu to the Alef class, we talked about the upcoming Jewish holiday, Shavuot, and how it’s a harvest holiday that occurs 50 days after Passover. We saw some videos about Shavuot and then had to run to the Shavuot Assembly. In this week’s GIML class we learned about the real origins of Mother’s Day as an anti-war holiday and had a debate for and against war backed by information we learned about the ongoing armed conflicts happening today in Iraq, Syria, Afghanistan, and Mexico. We completed a word search addressing concepts we have learned throughout the year including words such as, declaration, immigration, emigration, family, democracy, justice, etc. Near the middle of class, we welcomed a prospective student. All of the students were super about making him feel at home and they had a lot of fun. Finally, we went over ideas for what we could do for our final performance-the students were most excited about the prospect of doing a live debate addressing topics learned throughout the year. For our final GIML class, we prepared our end of the year presentation, allowing us to dive back into themes we have learned throughout the year. We started by reading “If I were in charge of the World” by Judith Viorst, and then changed the poem to reflect what we would do if we were in charge of the world. Then I introduced the structure for our performance, which they had instigated the week prior: We will be presenting a game show debate with 3 guests and 3 topics. I wanted something serious but they weren’t into that – only funny topics! That is where we compromised and decided to do funny topics that are a metaphor for serious ones – like labor rights, immigration rights, and identity politics. They developed the dialogue and characters all their own and had insightful points and metaphors. We look forward to presenting it at graduation! Today, Daled discussed Jewish history, tradition, myth, and mystery surrounding Mother’s Day, the Counting of the Omer, and Shvues. The class came up with several other common countdowns, including counting down to New Year’s Eve dropping of the ball and advent calendars around wintertime holidays. We learned the story of Ruth (and Naomi, Boaz, Orpah, etc.) and her self-proclaimed Jewish identity. With so many interfaith and multicultural families among us, as well as several students’ families having relatives who have converted to different religions, it was interesting to have a discussion about inclusivity and religious and cultural identity and community. Everyone was amused by the custom of giving someone your sandal or shoe to seal a deal, a tradition uncovered through the telling of Ruth’s story. Students’ questions led to a great discussion about metaphor, idiom, myth, and literature reinterpretation. With several beloved relatives and Sunday School faculty in today’s Mother’s Day performance, Daled was excited to be in the audience for some of it. Daled recapped the Jewish history, tradition, myth, and questions we have explored all year. Students created several original jokes to tell as part of our upcoming culminating Sunday School celebration. We managed to prepare material that corresponds to almost every major holiday we have investigated together over the course of the year. Everyone is psyched to share their silliness for our final day. Last week, a small but mighty Hey class explored a range of topics. The students arrived excited about Mother’s Day, so we read Julia Ward Howe’s original Mother’s Day Proclamation, an anti-war statement. The students were also curious about mothers and Yiddish, which led us to listening to the Yiddish vaudeville song “A Yidishe mame” – a sad and rather nostalgic number, which we discussed in the context of its time period: the first generation of American-born Ashkenazi Jews, struggling with issues of assimilation and abandonment of Yiddish culture. We then launched into our main topic, with the students each writing a description of Sholem for someone who has never been here. We then compared each student’s description with that of the Sholem website, and found that the students had picked up on most of the major concepts: secular, Jewish, history, community, non-religious, progressive, culture. After break, we read excerpts from the article “Reports from our Local Shuln” published in the Los Angeles Yiddish journal Mayriv in 1925 and translated by Hershl Hartman. 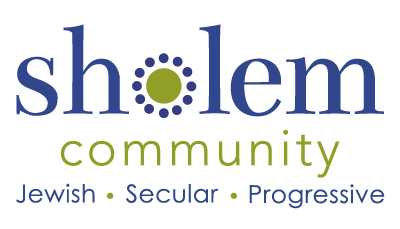 We discussed the similarities and differences between the secular Jewish schools described in the article, and how they are similar to or different from Sholem. The students found a number of close similarities, including student discussions, music and dance classes, and “revolutionary” politics, but noted that the students of these schools attended up to 3 times per week and some had larger enrollments than Sholem, as well as a greater focus on Yiddish. We then detoured into a brief discussion of the Russian Revolution (courtesy of a song from “Anastasia”), followed by a discussion of the Red Scare, anti-Communist propaganda, Senator McCarthy and HUAC, and the blacklists, watching a scene from Woody Allen’s “The Front.” The students already had some familiarity with this time period, especially those with parents in the film industry. This was their first introduction, however, to the fact that Sholem was founded as a response to the blacklists and their effects on the children of the blacklisted writers. The students then went to join their mothers for the final few acts of the Mother’s Day performance. This week, Hey class worked on our two projects wrapping up the school year: our ongoing art project, and our performance for graduation. The Hey students have each chosen to learn about a historical or fictional figure related to the periods in Jewish history we have studied. We began by each continuing to research basic facts about our character and thinking about a phrase that summarizes an aspect of their beliefs or actions. We continued with some improvisation games, creating poses and actions related to our character, and then creating dialogue between them. After break, we worked on creating a storyline for our performance, which we will look forward to sharing next week at graduation! The Vov class spent the previous two weeks wrapping up on the year. On the 14th, we carried over some ideas from the deep discussion they’d had the previous week with David Gordon that began with the Stanford Prison Experiment and spiraled into many pertinent questions and ethical quandaries the kids will be grappling with as they transition into young adulthood. The class also watched a sequence from the series American Gods. Part of the show involves coming to America stories, in which these travelers bring with them the gods of their homeland. The scene they watched is aboard a slave ship, and the spider god Anansi spurs on a revolt while offering a chilling and powerfully prescient overview of race and racism in America, from the dark days of slavery until today. What Makes This Bar/Bas Mitsve Ceremony Different?